The recipe for vegetable handvo has been in my recipe book (followers may recall that all my recipes since I started cooking, are jotted in a big diary given to me by my dad) even before I got married. My friend’s mum use to make this very often as a snack or as a meal. When Padmajha Sureshbabu of Seduce your tastebuds gave me corn and sesame seeds for the shhh cooking secretly challenge, I immediately thought of the vegetable handvo. Obviously there were so many other corn recipes popping up in my mind as I love corn, but I couldn’t miss the opportunity to blog one of my written recipes. 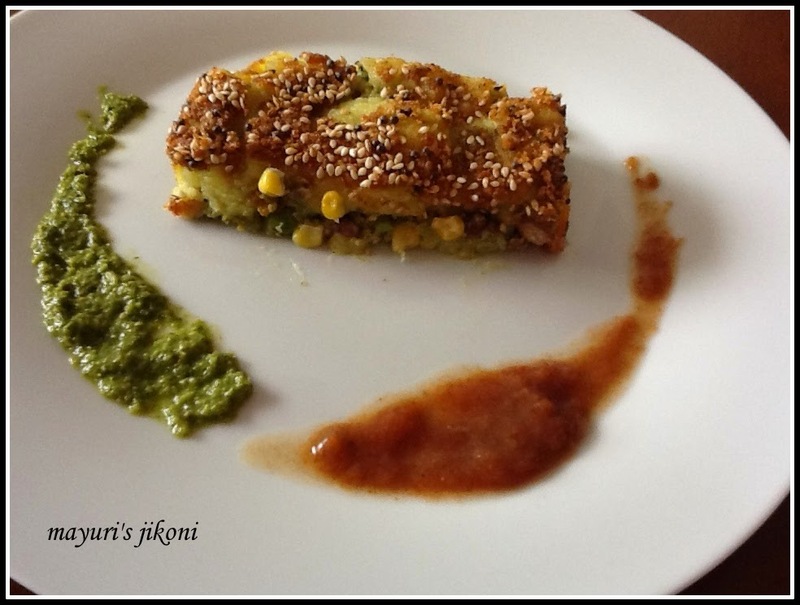 Before I proceed to the recipe, I must mention that Padmajha’s blog is very interesting recipes she does book reviews. The write up is done so well that you get tempted to read the book. Do visit her blog. This handvo recipe is not like the normal handvo that Gujaratis make. This handvo is just vegetables, no rice or dal flour. Its a good dish to have as a snack, or as a light meal with salad. The base is mashed potatoes but you can add any type of vegetables you prefer. Boil the potatoes in enough water till done. Add salt, pepper, milk, butter, turmeric powder and lemon juice and mix well. Boil peas, beans, carrot and corn in salted water. Drain out the water. Heat oil in a a wide pan over medium heat. When it becomes hot, add cumin and mustard seeds. Add asafoetida and onion. Stir fry till the onion becomes soft. Add the coconut and stir fry for a minute or so. Add chilli and ginger and stir fry for a few seconds. Add the vegetables, salt, sugar, red chilli powder, garam masala and lemon juice. Grease a baking dish with oil. I used a 8X12 ” baking tray. Divide the potato mixture into 2 parts. Pat one part of the mixture into the tray, covering the bottom. Spread ¼ cup of khajur chutney over it. Now make the layer with the vegetables. Spread ¼ cup of the green chutney over it. Now the tricky part, the layer of potato. Pat a bit of the potato mixture between your palms to make it thin. Layer it on top of the vegetables. Repeat with the remaining mixture till the vegetables are fully covered by the potato layer. Sprinkle the potato layer with the breadcrumbs. Heat the oil for topping in a small pan. Add the cumin, mustard and sesame seeds. When the seeds begin to pop, take the pan off the heat. Spoon the mixture over the breadcrumb layer. Bake the handvo in the oven for 20 -25 minutes till the top is golden brown. Serve the handvo with the remaining chutneys. Use any vegetable of your choice. Serve with tomato ketchup or any other chutney of your choice. Use a tray of your choice. For a more thicker potato layer boil more potatoes. G'day! This looks delicious Mayuri and congrats on completing this month's Shhhhh Cooking Challenge too! Healthy and delicious handvo, loaded with vegetables.. Delicious handvo with a different touch.. Stunning handvo, this dish rocks Mayuri. Nice Post…I enjoyed this blog post. It was helpful..